This post is sponsored by WinterSweetz grapefruit. All opinions are my own. Thank you for supporting the brands that keep Lively Table running! Holy moly, you guys. Has anyone else bunkered up in their houses to avoid all contact with other people and their germs? The flu is going around like crazy everywhere, and as a pregnant lady with a weakened immune system, I am not going anywhere I don’t have to! I mean, they are closing schools where I live because too many kids are sick. Yikes! As much as I wish I could, I can’t shut the outside world and it’s germs out completely. I still have to go out in public, and Mr. Table still has to go to class (a breeding ground for illness-causing bacteria). But the last thing this mama-to-be wants is to get sick. Besides basic things like washing my hands regularly and getting enough sleep, I can also keep my immune system as strong as possible by making sure I’m getting all the right nutrients. Plenty of fruits and vegetables and lots of water are good places to start. But for times I feel like I need a little more (like right now!) 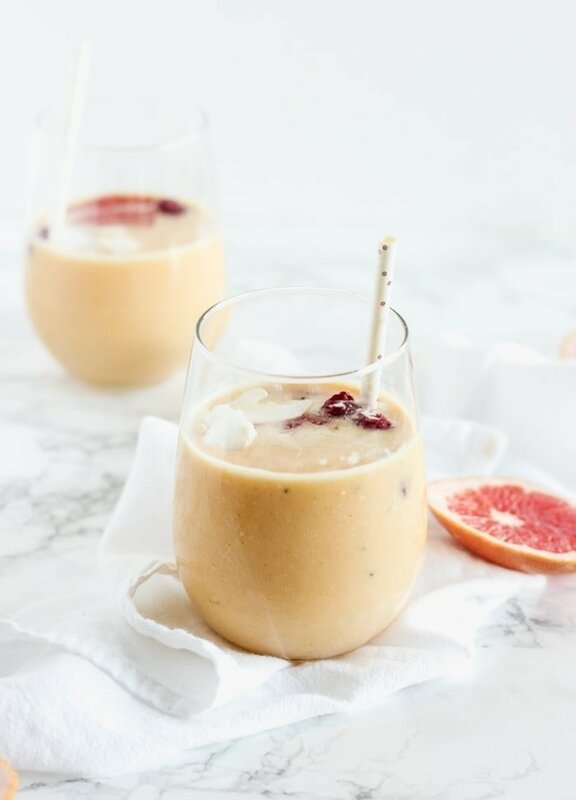 I make this nutrient-packed immune boosting grapefruit mango smoothie to help give my system a little extra help! This smoothie is loaded with all kinds of immune boosting ingredients. Ruby red WinterSweetz grapefruit is loaded with vitamins A and C, both of which can help protect you against illness causing germs. Mangoes are also good sources of vitamins A and C, so this smoothie has lots! More recently, research has shown immunity enhancing effects of both probiotics, found in cultured yogurt and kefir, and turmeric. This smoothie has both! Finally, honey also had antibacterial properties, so I added just a bit, but if you like your smoothie less sweet, feel free to leave it out. 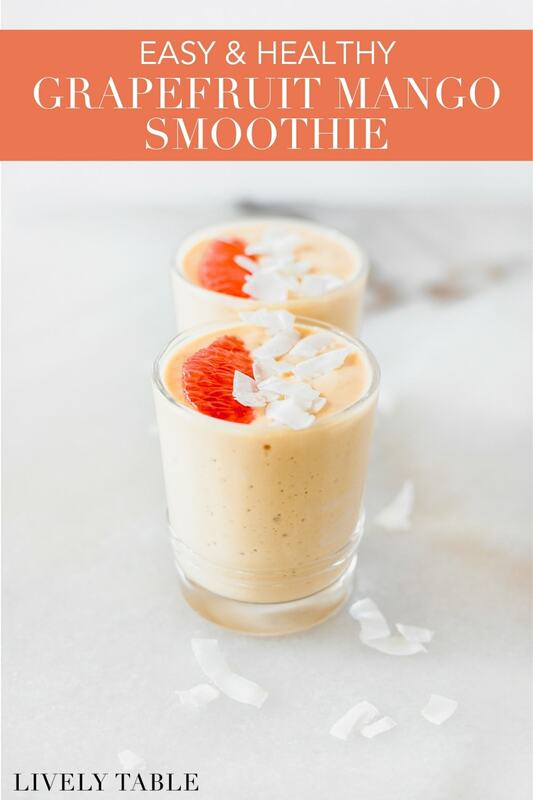 The combination of ingredients makes for one delicious illness-fighting smoothie that tastes amazing! If you’re a smoothie bowl kind of person, you can pour this immune boosting smoothie into a bowl and decorate it with all kinds of toppings. I used grapefruit segments, frozen raspberries, chia seeds, and coconut flakes. 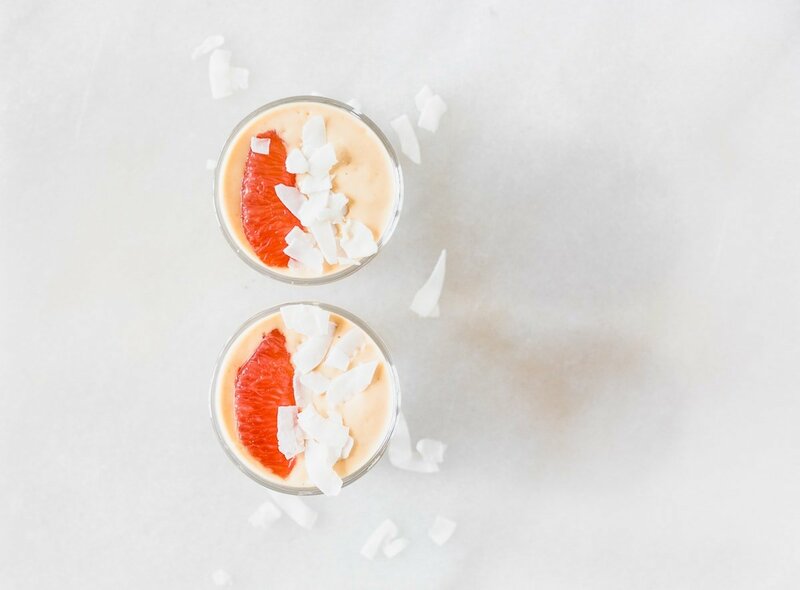 If you’re more of a drink on-the-go kind of person, blend this smoothie up and take it to go so you can sip it on your commute (while you’re avoiding other people, of course). I prefer the glass and straw myself. But either way makes a delicious breakfast or snack! Just looking at this pretty smoothie makes me feel a little better. What do you do when you feel the sniffles coming on? Add this immune boosting smoothie to your arsenal this winter to help you fend off any flu bugs that may be coming your way! 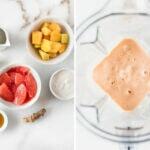 Place all ingredients in a high-powered blender. Blend until smooth. Pour into a glass or bowl and top as desired. Enjoy! Be sure to segment your grapefruit properly to ensure the sweetest flavor! *Use nondairy milk and nondairy probiotic yogurt for vegan/dairy-free. This sounds oh so refreshing and delicious! I’m loving turmeric in so many dishes. Love the cute glass and straw as well as your lovely smoothie bowl! I never think to use grapefruit in a smoothie, but I’m going to start using it now! this looks so delicious! This is beyond gorgeous! Almost too pretty eat. But who am I kidding, I’d totally eat this! Yum!